Prominent social media personality Mark Lopez burned down Karen Davila on Twitter after the TV Host's recent statement defending Maria Ressa. Karen Davila stated that Ressa's arrest is clear harassment. Karen Davila tweeted "CLEAR HARASSMENT. 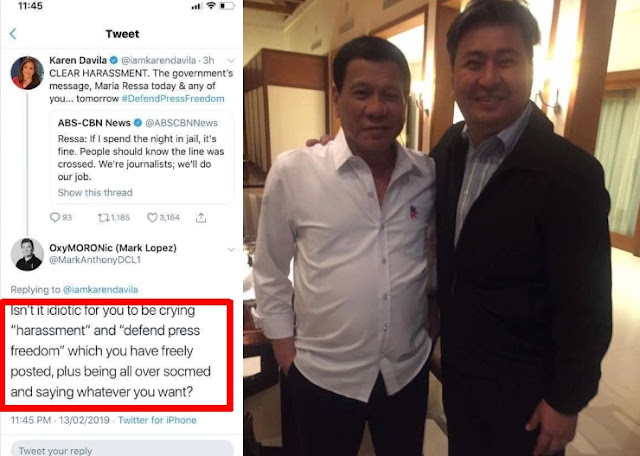 The government's message, Maria Ressa today & any of you... tomorrow #DefendPressFreedom" and added a link to an article published by ABS-CBN. In the said ABS-CBN report, Maria Ressa was quoted as saying "If I spend the night in jail, it's fine. People should know the line was crossed. We're journalists; we'll do our job"
The statement of Karen Davila on Twitter reached the desk of Mark Lopez who immediately responded with Karen Davila's tweet and burned down the vetern TV host. Mark Lopez responded to Karen Davila by saying "Isn't it idiotic for you to be crying "harassment" and "defend press freedom" which you have freely posted, plus being all over socmed and saying whatever you want?"